There is someone missing this Christmas. I have two sons and one daughter, but also a mystery who broke my heart. My baby is missing. The one I carried but never got to hold. When you have experienced loss, the most wonderful time of the year is often anything but. Parties are not merry, lights are too bright. And if all is calm, if nights are silent, well … that only highlights what isn't. Who isn't. Childless homes are calm. Nights absent of babies are silent. In 2012, Christmas came four months after my second miscarriage, sixteen weeks after I saw my tiny hope—my tiny boy or girl—dance. That year, Christmas was nearly joyless. I have to tell you that because it is true. And the shards of joy I did possess were hard fought and fleeting. My knuckles remained white around my joy. My eyes stayed red and puffy searching out joy. What is this time of year like for moms walking through loss? If you ask me, it's like that feeling you get when you step out of a dark theatre in midday. You've been cocooned in darkness and you've learned to survive there and then boom—JINGLE BELLS JINGLE BELLS—you are thrust into the light of everyone's happy time. Oh baby, I dreamed of sharing this with you. It hurts. Emptiness is magnified, and grief seems to possess its own echo. This year (and every year! ), all of us at Coffee + Crumbs want to hold space for the hurting. We want to honor the women fiercely mothering their babies, even though they aren't together like they should be. We see you, we love you, and today, we come with a gift. Sweet friend to Coffee + Crumbs and mama to her precious son Titus, we are so pleased to introduce you to Hannah Hagen. Hannah is a wife, artist, and mom from Long Beach, California. She said goodbye to her baby boy Titus on his birthday: March 18, 2017. Hannah's steadfast faith, honest grief, and mighty love for her son have been nothing short of inspiring to us. 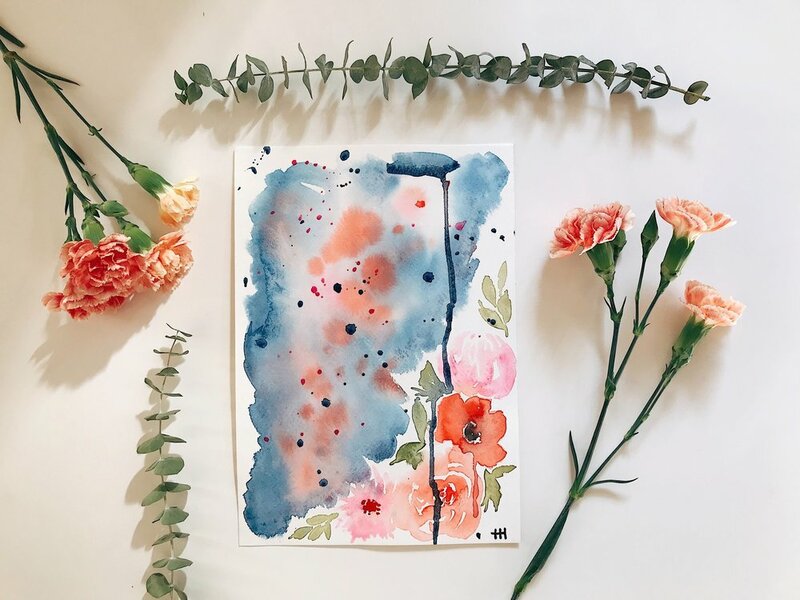 Hannah has been painting through her grief this year, and when we asked her to paint something for other grieving C+C readers, she immediately said yes. Her work is lovely and ethereal and warm, and we think you'll love it. Hannah so graciously painted something for all of us to enjoy but this piece of art was created especially for you mamas missing your babies this year. This one is for you. Click here to download the print. If you have a friend walking through loss this holiday season, we hope you can gift this print to her. Stick it in a frame, or attach it on top of a wrapped gift. Make sure she knows the artist was thinking of her while she painted. Laurelbox - My favorite is the Ring with Hope Bell. What a beautiful way to remember this Christmas. Through the Eyes of a Lion by Levi Lusko - I could not recommend this book more! A must-read for everyone; not just people in the midst of loss. This would be at the top of my list to buy someone this Christmas. Pinch of Yum: "A Holiday Survival Guide for Sad People" - Lindsay Ostrom from Pinch of Yum is one of those people who writes in a "you get me" kind of way. I've loved every single post of hers about loss. The Garden by Kari Jobe - The story behind these songs is truly a testament to how healing they've been in my life. Highly recommend. Champion by Bryan and Katie Torwalt - These melodies and the truth they proclaim have carried me during this season. Carly Jean Los Angeles - I'm obsessed with this online boutique. Their clothes are so soft, so cozy, so comforting. I tell people my style is, "I won't wear it if I can't sleep in it." Boom. Carly Jean delivers. Buy your friend who's hurting one of her soft pieces and she'll thank you forever. Grieving mamas, we stand beside you. We are doing our best to shield your eyes when the light gets too bright. We promise we aren’t going anywhere. Merry Christmas, baby. Your mama sure misses you. I am so sad your life was short, and I am also so grateful to the One who has given us forever.